The GGLC is once again arranging for a Lotus Corral at the 2012 Monterey Motorsports Reunion at Laguna Seca Raceway on August 19-21, 2011. Purchase your Monterey Motorsports Reunion ticket and Lotus corral pass from the GGLC and for a discount. The GGLC must sell at least 25 tickets and get 25 Lotus cars in the corral. Please order early and reserve your spot in the corral. 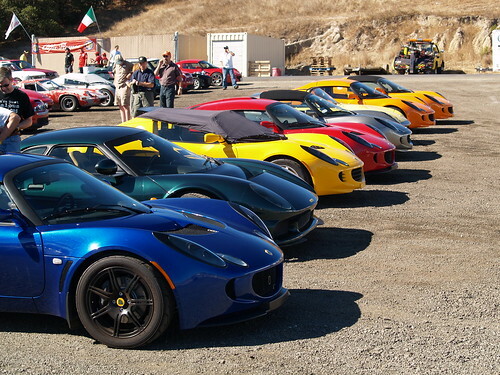 GGLC membership is NOT required, but you must drive your Lotus to the event to park in the GGLC Lotus Corral. The GGLC/Lotus Corral is available all 3 days! A corral pass is $10 and is good for all 3 days. You must purchase a ticket from the GGLC to be able to purchase a GGLC/Lotus Corral Pass. GGLC/LOTUS CORRAL PASSES ARE ONLY AVAILABLE FROM THE GGLC AND PURCHASING A TICKET FROM THE GGLC! Typically the tickets are sent to the GGLC 2-3 weeks prior and we will then immediately distribute them to you. Expect your ticket(s) and corral passes approximate one week prior to the event. DEADLINE TO BUY TICKETS & CORRAL PASS: JUNE 25, 2012! We will not be able get tickets and corral passes after this deadline! Click here to buy your tickets and passes on the GGLC website. 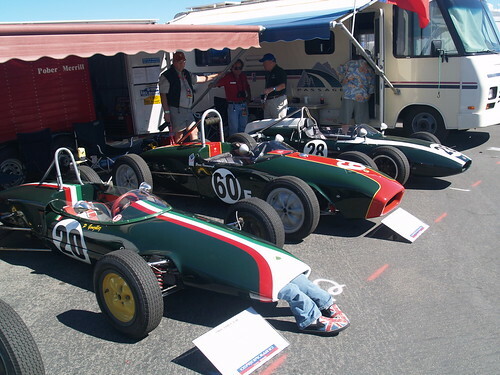 The Monterey Motorsports Reunion (formerly known as the Monterey Historics) has announced that the 2010 event (August 13-15) will feature 38 historic F1 cars will take the grid including a Lotus 49 and GGLC Member Chris Locke‘ Lotus 77. As mentioned before, the GGLC is once again arranging for a Lotus Corral at the event. Click here to purchase your Monterey Motorsports Reunion ticket and Lotus corral pass from the GGLC and for a discount. Please order early and reserve your spot in the corral. GGLC membership is NOT required, but you must drive your Lotus to the event to park in the GGLC Lotus Corral. DEADLINE TO BUY TICKETS & CORRAL PASS: MAY 25, 2009! We will not be able get tickets and corral passes after this deadline! Scroll down for the full press release and for pictures of Lotus from the 2007 event. For motorsports fans there’s no sweeter sound than the high-revving engines of Formula 1 cars. And for those attending the Rolex Monterey Motorsports Reunion August 12-15 at Mazda Raceway Laguna Seca, there will be plenty to see and hear as 38 historic F1 cars will take to the grid to celebrate the 60th anniversary of Formula 1. 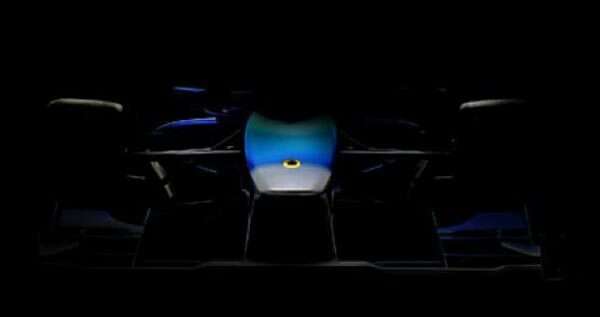 On the grid will be one of the most radical entries ever to succeed in Formula 1 competition. The 1976 Tyrrell P34 ‘six-wheeler’ used four, tiny 10-inch wheels and tires at the front and two ordinary sized wheels in the back. The idea of the smaller front tires was to increase air penetration and have a smaller ‘frontal area’ to reduce drag. Driver Patrick Depailler debuted the car and with team-mate Jody Scheckter earned one win and several high place finishes. No historic F1 race would be complete without a few of Colin Chapman’s revolutionary cars. The 1976 Lotus 77, known as the John Player Special MK II, driven by Mario Andretti to victory at the Japanese Grand Prix, will be on track along side the 1967 Lotus 49. The Lotus 49 was the first Double Four Valve powered car in F1 with an engine that not only was revolutionary; it started the Ford/Cosworth relationship. Driven by Jimmy Clark, it won its debut race at Zandvoort. This was the first F1 race car that had sponsor liveries. The red team from Modena, and F1, are two names that will forever be entwined with each other as Ferrari is the oldest surviving and the most successful F1 team in Grand Prix racing. Fans will experience the 1969 Ferrari 312 driven by Chris Amon and Pedro Rodriguez, the 1970 Ferrari 312B driven by Jacky Ickx which was the first F1 car from the Scuderia with the ‘boxer’ engine (flat 12 cylinders), and the 1980 Ferrari 312T5 which was driven by Jody Scheckter and Gilles Villeneuve. The Ferrari 312T series won 27 races, four constructers’ and three drivers’ championships. The Rolex Monterey Motorsport Reunion is honoring one of the true legends of motorsports- Dan Gurney who is one of five Americans to have won an F1 race. Additionally highlighting the 19 race groups will be a dedicated grid of 40 Bugatti race cars in the Bugatti Grand Prix, a featured race for Trans-Am; and for the first time ever, Stock Cars (with drum brakes) that competed between 1959 and 1975. The GGLC is once again arranging for a Lotus Corral at the 2010 Monterey Motorsports Reunion (nee: Monterey Historic Races) at Laguna Seca Raceway on August 13-15, 2010. Purchase your Monterey Motorsports Reunion ticket and Lotus corral pass from the GGLC and for a discount. The GGLC must sell at least 25 tickets. Please order early and reserve your spot in the corral. GGLC membership is NOT required, but you must drive your Lotus to the event to park in the GGLC Lotus Corral. # A few things have changed since last year. The GGLC/Lotus Corral is available all 3 days! # A corral pass is $10 and is good for all 3 days. These new “rules” are based upon the new policies from the Monterey Motorsports Reunion organizers. Click here to buy your Monterey Historic tickets. Typically the tickets are sent to the GGLC 2-3 weeks prior and we will then immediately distribute them to you. Expect your ticket(s) and corral passes approximate one week prior to the event. DEADLINE TO BUY TICKETS & CORRAL PASS: MAY 25, 2009! We will not be able get tickets and corral passes after this deadline! General Racing, which has created and produced the Monterey Historic Automobile RacesR for 36 years, will no longer be doing so. 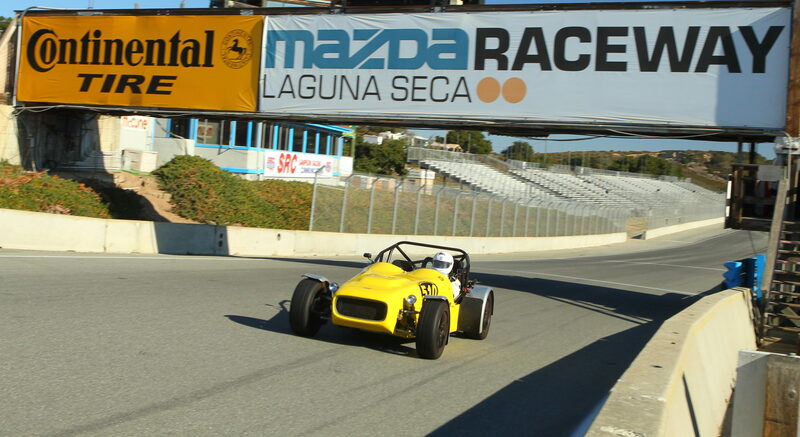 In the future SCRAMP, the Sports Car Racing Association of Monterey Peninsula, will organize a new event. On September 5, 2008, I was advised that the economic terms for the agreement between General Racing and SCRAMP were no longer commercially viable for SCRAMP. I’m disappointed that we were not able to come to an agreement that would allow our event to remain in Monterey. General Racing will allow SCRAMP a one-time use of the name Monterey Historic Automobile Races for the 2010 event. General Racing will continue the tradition of the Monterey Historics at the Wine Country Classic at Infineon Raceway in Sonoma, Calif., in early June 2010. We are very proud of all that we have accomplished with the Monterey Historic Automobile Races, and I truly believe that we have brought something special to the community of Monterey as an event of world renown and the generator of substantial revenue for the local economy and the charities to which SCRAMP contributes. The purpose of General Racing, Ltd., is and always has been to encourage the restoration, preservation and use of historic, sports and racing cars. General Racing events and races are for the enjoyment of participants and enthusiasts alike. 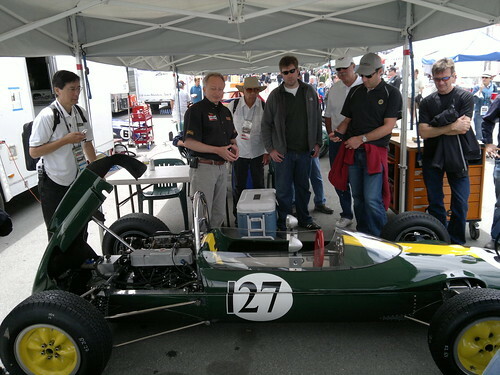 The GGLC is once again arranging for a Lotus Corral at the 2009 Monterey Historic Races at Laguna Seca Raceway on August 14-16, 2009. Purchase your Monterey Historic ticket from the GGLC and get a free corral pass to the GGLC Lotus corral. To get the Lotus Corral parking the GGLC must sell at least 35 tickets. Please order early and reserve your spot in the corral. GGLC membership is NOT required, but you must drive your Lotus to the event to park in the GGLC Lotus Corral. Corral parking on Saturday is separated by Club/Marque. Sunday corral parking is mixed marques. DEADLINE TO BUY TICKETS & CORRAL PASS: JUNE 10, 2009!